Hold on tight, I'm about to recommend a vampire novel. (I am just as shocked by this as you are.) In my defense, this is a decidedly complex and bloodthirsty vampire novel in which there is only a bit of romance and no one sparkles and and no one falls in love with someone who might remotely be considered "the girl who must save the world." In a word, Holly Black's Coldest Girl in Coldtown is fabulous and it simply must be read to be believed. In Black's America, the vampire infection has been identified and those who become ill are quarantined, along with full-blown vampires in "coldtowns." When initially bitten but before feeding, victims become physically cold thus confirming their infection. Teenager Tana finds herself in the middle of a vampire mess when waking up after a party that apparently took a horrifying turn while she was passed out. Facing certain death along with an old boyfriend and a mysterious but helpful stranger, she gets them out alive and finds herself on the kind of road trip that Kerouac needed a lot more drugs to dream up. Their destination is Coldtown in the former Springfield, Massachusetts. Along the way, Tana must tease out the stranger's story, keep her friend from losing his humanity, freak out over her own potential vampire-ness and deal with two of the most clueless teenage hitchhiker-bloggers in the history of the world. Winning means getting herself locked behind the gates where the most fabulous vampire party in the country runs live every night on the Internet. If only the whole thing wasn't so terrifying, it might just be fun. 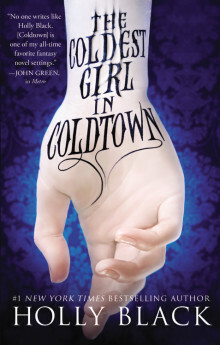 But -- and here is where Black truly shines -- every little bit of Coldest Girl in Coldtown is exceedingly terrifying. Between moments of sarcastic wit, readers discover Tana's desperate backstory, the equally troubling motivations of her companions and the desperate lives of those who dwell in Coldtown. Everyone has his or her own twisted story in this walled city and survival at its ugliest is the only thing that matters. Black strips all the glittery appeal from vampire life while making vamps themselves far more human then we have become accustomed to. Assholes in life are assholes in death and Coldtown is full of a lot of hungry, angry, confused, lost, royally screwed-up assholes. What readers won't expect is the craven nature of the humans who end up there as well and how the most base aspects of their natures are revealed to Tana as she tries to stay sane, stay alive, and dodge that damn infection. Every character in Coldest Girl in Coldtown is rich and complicated. This is a complex world the author has created and she relies on everyone within it to keep the narrative the irresistible adventure it is. I thought the vampire novel was dead, or at least on life support, but Black has done nothing short of a miracle here; she has made me care about fangs again. Darkly romantic in the manner of the oldest tales, mysterious and bloody and banked with shocking twists and turns, Coldest Girl in Coldtown is all of October's promise come to life. Somewhere, Anne Rice is chuckling with glee as finally the real vampire is back.